Hovi Star has been performing professionally since 2009, rising to prominence in Israel after taking part in the music reality TV show A Star is Born. 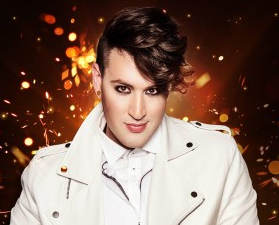 He will represent Israel in the 2016 Eurovision Song Contest with the song Made Of Stars. Hovi Star is one of Israel’s most recognised and beloved singers and since 2009 he has released several singles and performed hundreds of times, all over the world. Hovi also wrote and composed songs for other singers and was asked to join the dubbing ensemble for the Hebrew versions of Disney and Pixar box office hits including Frozen, Lego, Cinderella, Inside Out and others. Hovi’s childhood dream was to represent Israel in the Eurovision Song Contest. With rare vocal abilities and a winning personality, he recently took part in the music reality TV show, The Next Star for Eurovision. Hovi was a clear favourite from the beginning, winning the hearts of both viewers at home and the panel of expert jurors. Hovi is also highly interested in fashion, which will be reflected in his performance on stage in Stockholm. A language I don’t understand. We are… made of stars. Dance with me like we are made of stars. Danse avec moi comme si nous étions faites d’étoiles.